These are the words about a seventeen-year-old musician by a contemporary music critic, pianist and composer. Alas the premature death of Antoni Stolpe at the age of only 21 ruined all the hopes attached to his talent. The era when he lived and wrote, second half of the nineteenth century, was a very hard time for the Polish musical culture. It marked a considerable regression against the development of Polish music. Contemporary Polish composers were not so talented as to take full advantage of Fryderyk Chopin's accomplishments towards creating a Polish national school. To make things worse, the most promising among them, ones who were gifted enough to take over Chopin's legacy and go with it, died too young, while their works, which had often not found its due publisher and remained in manuscript, were in effect lost or went into oblivion. Such was the fate of compositions by Antoni Stolpe, whom both contemporary and later music critics hailed as the biggest talent after Chopin and before the age of Młoda Polska ('Young Poland' movement). Antoni Stolpe (1851-1872) was a descendant of a musical family. His ancestors had come to Poland from Sweden and the first records that we have on them from the early nineteenth century name two brothers: Alojzy and Antoni, pianists who played an active role in the musical life of Warsaw performing as soloists and chamber players. They both composed. They were also music teachers. Alojzy had two sons: Edward and Alojzy. The younger son, Alojzy, was a well-known Warsaw Opera singer and later became a dramatic actor. The elder son, Edward, followed in his father's footsteps and upon completing education at the Szkoła Główna Muzyki (Principal School of Music) in the class of Józef Elsner went on to work as a teacher of music at the Instytut Aleksandryjski Wychowania Panien (Alexander's Institute of Education of Maidens) in Warsaw. Apart from his teaching activities he also performed in concert and wrote small pieces of music. In 1843 Edward departed for Puławy in order to continue his work at the Institute, which had been relocated there. At about that time he married Marianna Turowska, whose family was also musical. The wife's sister, Józefina, was a singer in the Warsaw Opera while the eldest brother, Seweryn, a banking clerk by profession, was an organiser of various music events, an amateur singer and a poet. The relationship of Edward and Marianna gave birth to Antoni Stolpe in Puławy on 23 May 1851. Young Antoni lived in Puławy until the age of 11. His first teacher of music was his father, who became aware of Antoni's prowess quite early. Being conscious of his son's ill health, however, he did not want to expose it too much. In 1862 Edward Stolpe came back to Warsaw and took up the post of teacher of music at the Instytut Aleksandryjsko-Maryjski (Alexander and Mary Institute), and also at the Instytut Muzyczny (Institute of Music) set up in Warsaw by Apolinary Kątski in 1861. Young Antoni continued his education at the latter institution studying piano with his father and harmony and counterpoint with August Freyer and later with Stanisław Moniuszko. During the yearly gala performance of the Institute's pupils the young musician drew attention of the audience and critics alike with his unusually mature playing. This time also marks his first efforts in the field of composition, e.g. he wrote the vocal piece O Salutaris Hostia in 1866. 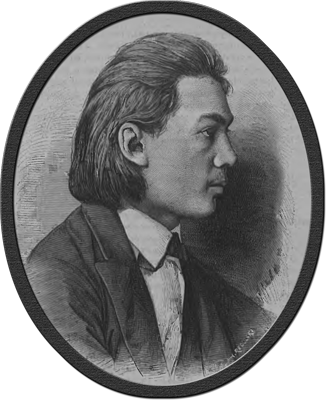 In June 1867 the sixteen-year-old Antoni Stolpe completed his education at the Institute with a "grand prize" in piano and a first prize in counterpoint. 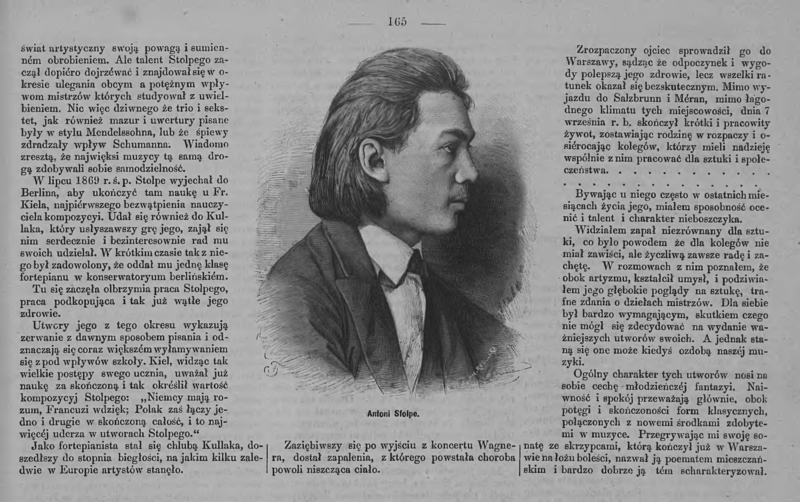 The July of the same year saw a concert of the best students of the Institute at the Resursa Obywatelska, where Stolpe played Chopin's Etude in C sharp minor and his own work - Mazurka in B minor. In the March of the next year the young composer performed in a hall of the Hoffer piano factory. There he made a presentation of his five new compositions: the Sextet for piano and string instruments, Overture for orchestra played by a string quintet and a piano for four hands, a Dramatic Scene for cello with the accompaniment of a string quintet, and two piano etudes: probably the Allegretto no 1 in A major and Allegretto non troppo no 2 in A flat major. The concert was attended by representatives of the musical world and the press, and reviewed by a journalist of the "Kurier Warszawski" (Warsaw Courier) in the following words: "After so numerous feats of mediocrity found in many concerts, it was extremely pleasant and reassuring to come across a genuine talent, supported by a thorough musical training and developing in the right and noble direction" ("Kurier Warszawski", 1868, 66). Stolpe's piano playing also attracted positive response. "It exhibited", according to an opinion by one of "Kurier Warszawski's" reporters, "clearness and precision of phrasing". "It could withstand the most dangerous comparisons". One of the etudes was twice encored. The "Kurier Warszawski" review ends with the following sentence: "Such extraordinary evidence of talent, hard work, education and goodwill enables us to believe that Mr Stolpe will not deviate from the course that he has chosen and will never trade, as is so often the case, a priest's dress for an apostate's costume". Antoni was eager to further his education of composition and playing. He was going to travel to Berlin to study counterpoint with Friedrich Kiel and perfect his playing technique with the famous contemporary professor Theodor Kullak. In order to realise the financial aspect of this project, he again performed during a concert held at the Resursa Obywatelska on 11 December 1868. Except the pieces that he had presented on the earlier occasion, he added new ones: Śpiew (Song) to the words by Victor Hugo accompanied by a string quintet, Trzy pieśni w formie etiudy (Three Songs in the Form of the Etude) for piano and Wielki marsz (Grand March) "Hommage a Mendelssohn" for orchestra. Stolpe performed as a pianist playing Liszt's Spanish Rhapsody and his own works and also conducted the orchestra of the Grand Theatre in Warsaw. For this concert he received a splendid review from Jan Kleczyński, who encouraged him to travel abroad in the following words: "Thus this artist will go forward with a wonderful background to study under such a master as Kiel. We couldn't finish our review about him better than to send farewell words of encouragement, and let them be prophetic: Macte animo, generose iuvenis; sic itur ad astra" ("Tygodnik Ilustrowany", 1868, 51). Unfortunately, the attendance at the concert was quite poor due to the performances of Helena Modrzejewska and Józef Wieniawski organised exactly at the same time. Thus the concerts did not bring the expected profits, so Stolpe was unable to fulfil his plan to go to Berlin. Antoni Stolpe's third consecutive concert was held in May 1869. The programme included new works: the Symphonic overture, Concert overture no 3, Piano Trio, Ave Maria for contralto and string quintet and two pieces for tenor and piano: the Romance (the words by Th. Gautier) and Sonnet (the words by Miron - A. Michaux). The Dramatic Scene and Hommage a Mendelssohn were played again together with the works of Chopin, Meyerbeer, Kurpiński and Noskowski. Noskowski performed also as a violinist playing two of his compositions: Pieśń nad kołyską (Song at the Cradle) and Scherzo. The solo parts were sung by Antoni Stolpe's aunt, Józefina Leśkiewiczowa, née Turowska. A fine write-up of this event was given by Władysław Wiślicki in "Kłosy" (1869, 184). He underlined the extraordinary composing talent of the young artist, especially evident in the works for orchestra. That last concert brought Stolpe an income that finally made his journey to Berlin possible. When he had presented and played his compositions in front of Friedrich Kiel, the composer wasted no time in sending a letter to Antoni's father to congratulate him on the son's talent. While in Berlin, young Stolpe also began his studies with Theodor Kullak at the Neue Akademie der Tonkunst. Upon seeing his exceptional abilities, Kullak offered him the position of a piano professor at the Academy. Apart from that, the accounts of Stolpe's stay in Berlin are few and far between. He wrote several pieces there, including the Allegro appassionato in C minor and Variations in D minor for piano, Variations for string quartet and Piano Sonata in D minor. Antoni Stolpe's last composition was completed in Warsaw in 1872; it was the Sonata for violin and piano. Zygmunt Noskowski in his Posthumous Memoir ("Tygodnik Ilustrowany", 1872, vol 10, 249) assessed it as his best work. During his stay in Germany, Stolpe performed at a public presentation of the higher classes of piano on 26 March 1871, playing alongside the professors of the school the Trio in C minor by Felix Mendelssohn and the first movement of his very own Sonata in D minor. Stolpe's visit to Berlin was cut short by illness, pneumonia, a consequence of a cold that he had caught on his way back from Wagner's evening concert. The family took Antoni back to Warsaw, but unfortunately the open tuberculosis that attacked the frail body of the composer was incurable at the time. Despite the family's efforts, visits to the spa resorts of Szczawno-Zdrój and Merano, Antoni was not saved. He died aged 21 in Merano on 7 September 1872. 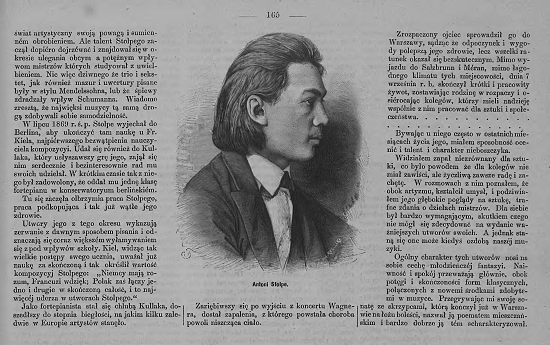 His friend Zygmunt Noskowski in the Posthumous Memoir, which was printed in the "Tygodnik Ilustrowany", in addition to his biography included a few sentences concentrating on the personality of the young composer. "I visited him quite often during the last few months of his life and was able to judge his talent and character. What I saw was an incomparable enthusiasm for art, one that made him offer his friends no envy but only an amiable piece of advice and encouragement. In the conversations that we had I learnt that he not only trained his artistic skills but also his mind and I admired his profound opinions on art and apt views on the works of the masters. For himself he was very demanding and in consequence he was unable to make a decision of bringing out his most principal works. But they will still become the jewels of our music one day" (Wspomnienie pośmiertne (Posthumous Memoir), "Tygodnik llustrowany", 1872, vol. 10, 249). Antoni Stolpe's works after his death were inherited by his father, whose mental breakdown stopped him from ever giving them to print. From among Stolpe's compositions only the Piano Sonata in D minor, and more recently also some of the chamber music (the Piano Sextet in E minor, Dramatic Scene for cello and string quintet and Variations in G major for string quartet) were brought out in print. The other works remaining in manuscript were passed on to the Państwowe Zbiory Sztuki (State Art Collections). Currently, the extant works are held at the Biblioteka Jagiellońska and the Biblioteka PWM. Wielki Marsz (Grand March) "Hommage a Mendelssohn"
In his works, Antoni Stolpe combined Polish musical tradition with the treasure trove of the European Romantic music. On the one hand, especially in his piano compositions, he was in a way a successor to the path established by Frederic Chopin, but at the same time, he was open to new trends, drawing on the music of Robert Schumann, Felix Mendelssohn, and even Richard Wagner. Stolpe's composing legacy is characterised by a considerably large stock of orchestral music. Taking into account the composer's young age and singular Polish conditions, whereby orchestral music could not evolve freely, either because of the lack of a professional symphony orchestra or only a slight interest shown in this type of music, Stolpe's achievements in this field seem particularly striking and impressive. He displayed a good expertise of orchestral technique and instrumentation. 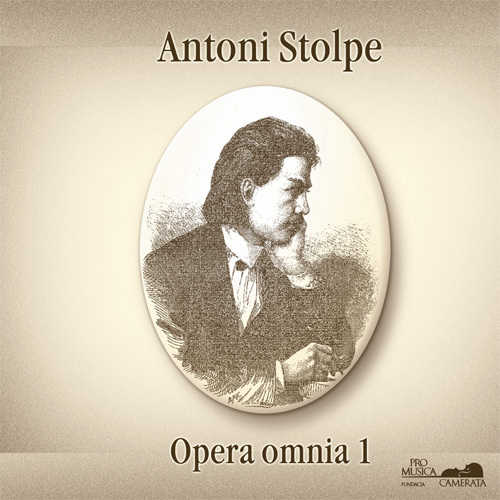 Antoni Stolpe's preserved orchestral works, as well as piano compositions, chamber music and vocal pieces, are an eloquent testimony to his great talent and capabilities. They let us presume that if not for his premature death he would have become an eminent figure contributing prolifically to the development of Polish and European music alike. Antoni Stolpe's oeuvre, for a long period of time, stayed outside the interest of musicians, performers or musicologists. 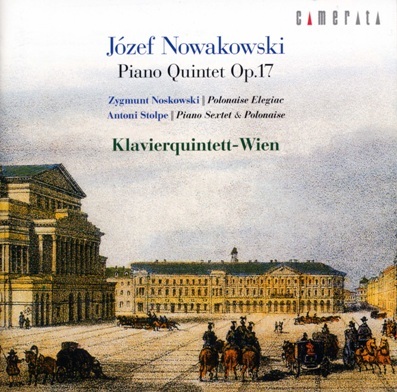 The Piano Sonata in D minor, after the composer's death, was included into the repertoire of Józef Wieniawski, thanks to whom the piece was brought out in print by the Warszawskie Towarzystwo Muzyczne (Warsaw Musical Society) in the company of Maurycy Orgelbrand in 1875 (the composition saw its second publishing edition in 1957 brought out by the PWM (Polish Music Publishers, a state-owned company) and edited by Maria Wiłkomirska). Sparse works devoted to Antoni Stolpe were spurred by a publication of a list of his compositions in 1907, a credit owed to Aleksander Poliński and then in the inter-war period the composer's biography was studied by Stanisław Golachowski. After the Second World War, the piano pieces of Antoni Stolpe became the subject of the musicological research carried out by Teresa Bronowicz-Chylińska and Katarzyna Barwinek, whilst the orchestral works were studied by Władysław Terlecki, as a part of his Master's Thesis in which he edited some of these compositions for performance, thanks to which they were played in the Bydgoszcz Philharmonic Hall in 1970. It has only been recently that the music of Antoni Stolpe has been rediscovered and presented to the public, first of all, thanks to the cellist Andrzej Wróbel - a professor of The Fryderyk Chopin University of Music in Warsaw and the pianist - Stefan Łabanowski. The efforts of professor Andrzej Wróbel were rewarded as Pro Musica Camerata published some of the chamber music of the composer: the Piano Sextet in E minor, Dramatic Scene for cello and string quintet and Variations in G major for string quartet (Warsaw 2003). These pieces and also Romance for violin and cello with the accompaniment of piano were recorded by the Camerata Vistula ensemble (the album released by Pro Musica Camerata in 2006). The above-named compositions were also performed by the Camerata Vistula ensemble at the Polish Chamber Music Festivals, organised thanks to the efforts of professor Wróbel. Antoni Stolpe's piano works are rediscovered and popularized for a wider audience by the pianist, Stefan Łabanowski, who recorded these works. This recording, being the world première, was released by Acte Préalable in 2010. Earlier - in 2008, a double album, containing Antoni Stolpe's piano pieces performed by Mirosław Gąsieniec, was released by Pro Musica Camerata, but that album cannot be, without serious reservations, regarded as the recording of original compositions of Antoni Stolpe, because Stolpe's works recorded by Mirosław Gąsieniec do not conform to the composer's original text. Some of them were amended by the pianist with fragments of his own composition, while others considerably changed as regards the text and texture. The artist even went as far as to create his own paraphrases, e.g. in the Finale of the Variations in D minor (which were, by the way, not recorded in their entirety - four variations were omitted and their order was altered). Thus Stefan Łabanowski's recording is the first where Antoni Stolpe's works have been performed in accordance with the composer's original text. This album contains all his most important finished piano pieces: the Sonata in D minor, Variations in D minor, Allegro appassionato in C minor, Scherzo in C major, Andante in A flat major, Waltz in B flat major, Allegretto No. 1 in A major and Allegretto non troppo No. 2 in A flat major. All the above works were presented to the public by Mr Stefan Łabanowski also during concerts, among others: in 2010 - at The International Princess Daisy Chamber Arts Festival Ensemble in Wałbrzych, in 2011 - on the 160th birthday anniversary of the composer - at the concert in the Czartoryski Palace in Puławy, which is the birthplace of Antoni Stolpe, as part of The CAPER LUBLINENSIS Cultures Meeting Festival, organised by The Henryk Wieniawski Lublin Philharmonic, or on 2012 - which was the 140th death anniversary of Antoni Stolpe - at a concert at The Karol Szymanowski Philharmonic Hall in Cracow. Antoni Stople's piano works were also the subject of Stefan Łabanowski's doctoral program in piano performance, which he completed at The Fryderyk Chopin University of Music in Warsaw in 2012. Andrzej Wróbel and Stefan Łabanowski inspired also other artists and music institutions to grow an interest in the music of Antoni Stolpe, which resulted in a few musical events - those worth mentioning are the recording of the Piano Sextet in E minor and Polonaise in A flat major for piano with the accompaniment of a string quintet by Klavierquintett-Wien (the album released by Camerata Tokyo in 2010), or The Antoni Stolpe Music Festival organised at the end of 2011 by the Kalisz Philharmonic thanks to the financial support of The Institute of Music and Dance, during which some of the orchestral, chamber and piano pieces were performed.